Fertigation is the application of fertilizer with irrigation water. This article will discuss fertigation using drip irrigation and commercial fertilizers that can be used in certified organic systems. Little research has been done in organic fertigation, so many questions remain about best practices, benefits, and drawbacks. Fertilizer can be applied using any irrigation system. In fresh market vegetable production, drip irrigation is the most common system used for fertigation and requires the most knowledge for effective use. Drip irrigation, also known as micro irrigation or trickle irrigation, applies water slowly, directly to the soil around the crop. Drip irrigation generally uses less than half the water of overhead and furrow irrigation. Efficiency with drip irrigation exceeds 90% whereas a sprinkler system is between 50 to 70% efficient. The high efficiency of drip irrigation is due to (1) the water soaking into the soil before it can evaporate or run off and (2) application of water only where it is needed (near the crop) rather then over the entire field. In drier climates, the application of irrigation water to the crop zone rather than the entire field aids in reducing weed pressure between rows. Another advantage of drip irrigation is that it reduces water contact with above ground crop growth (leaves, stems, and fruit) thus making conditions less favorable for many diseases. Growers with variable water resources may also appreciate the lower pressures (8–10 psi at the drip line) required to operate a drip irrigation system. A well maintained and effective drip irrigation system is required for successful fertigation. Refer to Drip-Irrigation Systems For Small Conventional Vegetable Farms and Organic Vegetable Farms and other resources listed below for information about design, operation, and management of drip irrigation systems. Any nutrients in a soluble form are available for plant uptake right after application, allowing the farmer greater control over nutrient availability to the crop. These factors can lead to more efficient use of fertilizers. Nutrients may be applied on a daily, weekly, or less frequent basis, depending on the overall nutrient management plan for the crop. When nutrients are applied shortly before they are needed, growers are able to reduce loss of nutrients from the root zone. This is particularly important in areas with high rainfall, and for dissolved nutrients that leach readily, like nitrogen. Compared to methods of applying nutrients during the season that require tractors or foot traffic, fertigation reduces the potential for compaction and is less dependent on weather conditions. When fertigation is used it should be included in the overall nutrient management plan for the crop or field. The total nutrients provided through fertigation plus other fertilizer applications should not exceed 100% of the planned total nutrient application rate. Various units are used to describe the quantity of nutrients applied to or needed by a crop over a growing season: lb/A, lb/sq.ft., lb/plant, and lb/linear bed foot are examples. When area measurements such as acres or square feet are used in this context, the area is typically considered to be the entire cropped section of the field, not just the area of the beds or the crop rows. However, in some situations with permanent beds or very widely spaced beds, just the bed area may be considered when calculating the quantity of nutrients applied. In any case, it is helpful to think of nutrients applied through irrigation in the same units as those used for other nutrient applications, because that makes it easy to see how fertigation fits into the overall nutrient management plan. For instance, a tomato producer may know that the crop will require about 100 lb/A of nitrogen over the growing season, and estimate that the legume cover crop will supply about 50 lb/A of nitrogen, and therefore plan to apply 50 lb/A of nitrogen through fertigation. That 50 lb/A could be applied over many weeks: 10 lb/week for 5 weeks or 7 lb/week (equivalent to 1 lb/day) for 7 weeks, for example. In some production systems, fertigation application rates are described based on the concentration of nutrients in the solution. For instance, tomato seedlings in a greenhouse may be fertigated with a solution containing 75 ppm (parts per million) nitrogen, or pac choi grown in the field may be fertigated with 150 ppm nitrogen. This terminology is common in container production and when fertilizer is provided at every, or nearly every, irrigation. The nutrient concentration does not provide information about the amount applied per acre, per square foot, or per plant, unless the total volume of water applied is also known. Little research has been done in organic systems to determine the best schedule for applying fertilizer through an irrigation system. We know that it is important to have nutrients available in the soil when the crop needs them, so they are typically applied before they are needed. We know that nutrient uptake generally parallels crop growth. With this in mind, it makes sense to have most of the nutrients that will be needed by the crop in the soil by the time the crop begins rapid growth, and to apply the rest during the period of rapid growth. As the crop nears final harvest and/or growth slows, nutrient application may be tapered down and even stopped. To plan for fertilizer application, it may help to make a chart showing each week of crop production from planting through harvest, indicate the approximate size of the crop at the beginning of each week, and then schedule fertilizer applications taking into account the timing of crop growth. The goal of fine tuning fertigation schedules for organic production provides an opportunity for on-farm and university research. additional time to flush the system. For example, assume it takes ½ hour for water to travel from the injection point to the furthest emitter, and 1 hour to inject the solution, and ½ hour to flush the system. Then, fertigation should begin 2.5 hours before the end of the irrigation event: ½ hour for water to travel from the injection point to the furthest emitter + 1 hour to inject the solution + ½ hour for last bit of fertilizer solution to reach furthest emitter + ½ hour to flush the system. If it takes 7 hours to apply the desired amount of water to a field, then in this example, fertigation would begin 4.5 hours ( 7 − 2.5) after irrigation starts. Refer to resources on drip irrigation listed below for additional information on scheduling drip irrigation. Nutrients must be completely flushed out of the irrigation system after injection to keep drip lines clean and to prevent clogging. If clogging becomes a problem, it may help to open ends of the laterals and flush water through the drip tape and out the ends of the lines periodically during the season. Nutrients delivered through drip irrigation will be distributed following the wetting pattern of the soil. Soil wetting patterns tend to be hemispherical or oval with the widest portion at the depth of the emitter (or soil surface if drip tape is not buried) and the deepest point directly below the emitter. The distance that water will travel horizontally in the soil and the wetting depth are dependent on soil texture, irrigation rate, and irrigation duration. Irrigation rate and duration should be adjusted based on crop water needs. The following are some general guidelines regarding fertigation products and irrigation systems for injecting fertilizers, adapted from "Commercial vegetable production, fertigation of vegetable crops" (Marr, 1993). Use fertilizer that mixes readily with water; if product does not dissolve completely, it should have small particle sizes that will stay in suspension and pass through emitters without clogging. Completely pressurize the drip irrigation system before injection begins; the emitter farthest from the pump must be at full pressure when injection is initiated. 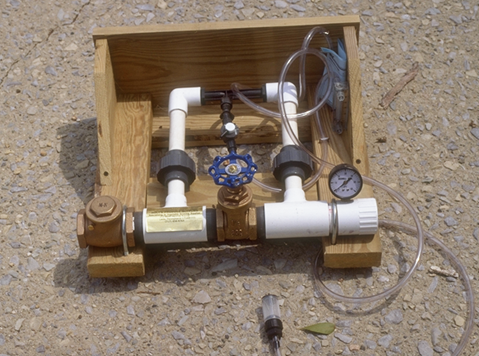 Install a backflow prevention device between the water source and the fertilizer injector to protect the water source. In some states this is required by law and device characteristics may be specified. Check with your state or local authorities. Install a filter between the injector and the laterals to ensure that undissolved particles are filtered out so they do not plug emitters. Depending on water source and injector type, a filter may also be required between the water source and injector. Inject fertilizer for at least as long as it takes the system to reach full pressure. This allows each emitter in the drip line to have the same contact time with the nutrient solution as it travels through the irrigation system and reduces variability in fertilizer distribution. Completely flush nutrients out of the irrigation system after injection to keep drip lines clean and to prevent clogging. Injectors disburse a concentrated nutrient solution into the mainline of the irrigation system. There are two basic modes of action for fertilizer injectors: venturi and positive displacement. Venturi Bypass: A venturi injector operates under the principle that suction (negative pressure) is created when water passes through a zone of constriction. This suction is used to draw fertilizer solution into the irrigation line. Water pressure and flow rates are somewhat variable with venturi injectors resulting in an irrigation fertilizer concentration that follows a pulse-like pattern during the injection time. However, in many operations a constant concentration in the final solution is not necessary, and venturis are used successfully on many farms. The Hozon is the most common example of a simple, inexpensive and easily maintained venturi injector. Such small injectors have a low injection ratio and thus require a large fertilizer stock tank, thereby limiting their use to small areas (typically ½ acre or less). Larger venturi injectors, such as the Mazzei (Fig. 1), are available for larger acreages. Figure 1. A Mazzei injector, ready to be inserted into the irrigation line, is a commonly used venturi bypass injector and is suitable to fertigate areas larger than ½ acre. Photo credit: Tim Coolong, University of Kentucky. Positive displacement: Positive displacement injectors utilize the reciprocating action of a piston or diaphragm to inject fertilizer into the irrigation line. These pumps are installed inline and do not require a bypass (Fig. 2). Water pressure, as it flows through the injector in the irrigation line, provides the energy needed to activate the injection process. Fertilizer solution is pulled into the irrigation line in precise volumes at a constant concentration and flow rate. 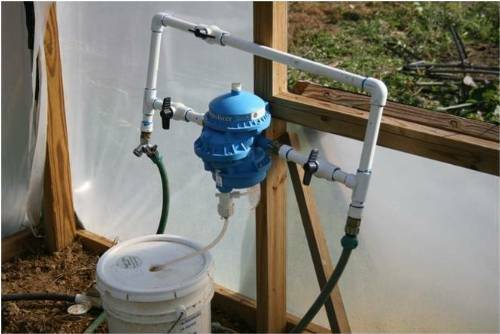 In a diaphragm pump the fertilizer solution does not come into contact with the pump mechanism, unlike the piston pump. For this reason, the diaphragm pump has fewer operational, maintenance and replacement part issues. Positive displacement injectors provide greater injection ratios and require a smaller fertilizer stock tank. These attributes make these injectors suitable for large acreages. Some commonly used brands of positive displacement injectors are the Dosatron, DosMatic, and Chemilizer injectors. Figure 2. A Chemilizer injector is an example of a positive displacement diaphragm injector. Photo credit: Tim Coolong, University of Kentucky. For fertilizer to be effectively delivered by irrigation, the fertilizer must be soluble, and/or any undissolved particles must be able to travel through the irrigation system without causing blockages. There are many organically approved liquid fertilizers and powdered fertilizers that are completely soluble that can be used for fertigation. Refer to the USDA National Organic Program Handbook (2010) for new information regarding liquid organic fertilizers. Table 1 lists products from the Washington State Department of Agriculture (WSDA) Organic Food Program Brand Name Material List and the Organic Materials Review Institute (OMRI) Product List (as of March, 2010) that were identified by their label as suitable for fertigation. For more information regarding inputs, read the related eOrganic article Can I Use This Input On My Organic Farm. Always check with your certifier before using any new product. Table 1 includes a cost analysis of fertigation products based on cost per unit nitrogen. The analysis involved three steps. First, the price of the product from commercial suppliers was determined (products were priced November 2009). Second, for products sold on a volume basis the manufacturers were contacted for volume weight information. For example, if a product was sold by the gallon, the manufacturer was asked how much a gallon of the product weighs. And third, the value for nitrogen content on the product label was used to calculate the cost of one pound of nitrogen from that product. To calculate the cost of each fertilizer product, the organic fertilizer calculator developed by Oregon State University was used. Based on this analysis, the costs per pound of nitrogen for liquid and soluble organic fertilizer products ranged from $4.60 to $136.50 per pound and the amount of nitrogen in fertilizer products ranged from 0.4 to 5%. Table 1. Cost analysis of organically approved fertilizer products listed on OMRI and WSDA databases on March 1, 2010 that can be used for fertigation; products are listed in order of cost from least expensive per unit N ($/lb N) to most expensive. Always check with your certifier before using any new product. Additionally, some products dissolve easily in water and are rapidly injected into the irrigation system without causing problems such as clogged filters and emitters, while other products do not dissolve easily or are more likely to clog emitters. Another important issue is the presence of soluble salts in the fertilizer. Several organic liquid and soluble fertilizers, especially those that are higher in nitrogen, tend to be made with sodium nitrate (NaNO3), commonly called Chilean nitrate or Chile saltpeter. Sodium nitrate is a naturally occurring nitrogen compound that is 16% nitrogen (N), is used extensively for organic fertilizer, and is highly water soluble. When sodium nitrate dissolves, the sodium ion is available for plant uptake in the soil solution and can be problematic for some crops when it is present at relatively high rates. Growers are advised to test products on a small scale to make sure the product is suitable for the particular irrigation system and crop(s) where they will be used. While sodium nitrate is allowed, the NOP regulation states that use of sodium nitrate is restricted to no more than 20% of the crop's total nitrogen requirement. Growers should also be aware that in October 2009 the USDA National Organic Program (NOP) required a thorough review of all liquid organic fertilizers with nitrogen levels higher than 3%. This review was due to the NOP finding in early 2009 that two liquid organic fertilizer products on the market in the U.S. were not compliant with NOP regulations. The two products were Marizyme and Agrolizer, both made by Port Organic, Ltd. Fertilizers with higher nitrogen percentages (>3%) must now have documentation provided by a third party inspection, proving that all nitrogen comes from approved sources. As a condition of being recognized by the NOP, third party reviewers of products must audit fertilizer producers based on NOP regulations, as well as undergo an audit themselves. These more rigorous measures are intended to help certifiers make the best judgment possible when approving organic fertilizers and other inputs. Buchanan, J. R. 2000. Fertigation for commercial fruit and vegetable production [Online]. Bootheel Irrigation Conference and Tradeshow, University of Missouri, Portageville, MO. Available at: http://agebb.missouri.edu/irrigate/bhconf/2000/ppt1/ (verified 1 May 2010). Clark, G. A. 1992. Drip irrigation management and scheduling for vegetable production. HortTechnology. 2: 32–37. Clark, G. A., C. D. Stanley, A. G. Smajstrla, and F. S. Zazueta. 1994. Microirrigation design considerations for vegetable production. pp. 6–11. In Using plasticulture technology for the intensive production of vegetable crops. American Society for Horticultural Science Seminar, Sept. 28–29, 1994, Lexington, KY.
Fereres, E. (ed.) 1991. Drip irrigation management. Leaflet 21259. Division of Agricultural Sciences. University of California, Berkeley. Haman, D. Z., A. G. Smajstrla, and F. S. Zazueta. 2003. Chemical injection methods for irrigation. University of Florida IFAFS Publication No. CIR864. Available online at: http://edis.ifas.ufl.edu/wi004 (verified 1 May 2010). Hanson, B., L. Schwankl, S. Grattan, and T. Prichard. 1997. Drip irrigation for row crops. Division of Agriculture and National Resources Publication 3376. University of California Irrigation Program. University of California, Davis. Hartz, T. K. 1994. Water management in drip-irrigated vegetable production. pp. 12–15. In Using plasticulture technology for the intensive production of vegetable crops. American Society for Horticultural Science Seminar, Sept. 28–29, 1994, Lexington, KY.
Marr, C. W. 1993. Commercial vegetable production, fertigation of vegetable crops. MF-1092. Kansas State University Agricultural Experiment Station and Cooperative Extension Services, Manhattan, KS. Available online at: http://www.ksre.ksu.edu/library/hort2/mf1092.pdf (verified 1 May 2010). Pennisi, B., and R. Kessle. 2009. Fertilizer injectors: selection, maintenance and calibration. The University of Georgia Cooperative Extension Bulletin 1237. Available online at: http://pubs.caes.uga.edu/caespubs/pubcd/B1237/B1237.htm (verified 1 May 2010). Pitts, D., T. A Obreza, F. S. Zazueta, and J. Capece. 1996. Micro irrigation management. University of Florida IFAFS Workshop Series. Simonne, E., R. Hochmuth, J. Breman, W. Lamont, D. Treadwell, and A. Gazula. 2008. Drip-irrigation systems for small conventional vegetable farms and organic vegetable farms. University of Florida IFAFS Extension. Publication No. HS1144. Available online at: http://edis.ifas.ufl.edu/hs388 (verified 1 May 2010). United States Department of Agriculture. 2010. Program handbook: Guidance and instructions for accredited certifying agents & certified operations. Agriculture Marketing Service, National Organic Program. Available online at: http://www.ams.usda.gov/AMSv1.0/getfile?dDocName=STELPRDC5086323#nameddest=fertilizers (verified 12 October 2010). Washington State Department of Agriculture. 2001. Chemigation and fertigation technical assistance program. Available online at http://agr.wa.gov/PestFert/ChemFert/docs/CftapBrochure.pdf (verified 1 May 2010).